The Duquesne University School of Pharmacy chapter of the Student Society of Health-System Pharmacy (SSHP), a branch of the American Society of Health-System Pharmacists (ASHP), received a national Outstanding Professional Development Project award at the ASHP Midyear Clinical Meeting in Anaheim, CA last month. ASHP selected only 30 student chapters–out of 137 in the nation–to receive the award. 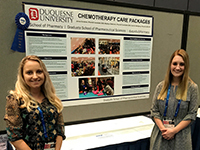 PYIII student pharmacists Jenna Christner and Maddie Stabinski, President and Service Chair, respectively, of the Duquesne University SSHP chapter, presented a poster on the Chemotherapy Care Packages program organized by the student organization every year. The organization gathers the most-requested items from a wish list provided by patients undergoing chemotherapy at Allegheny General Hospital and UPMC Passavant, including tissues, hand sanitizer, candy, puzzles, books, playdough, and motivational cards. The student pharmacists sort the items into bags to deliver to the hospitals for distribution. The student organization organizes and donates 200 care packages a year, providing just over 600 since starting the program in 2015. "We are a relatively small organization and being able to make such an impact on cancer patients is so gratifying," Christner said. "Having a notable pharmacy organization, like ASHP, recognize our success is a huge honor. We hope to continue Chemotherapy Care Packages for years to come!" According to a press release from ASHP, judges evaluated presentations on content and information, creativity and resourcefulness, service, outreach and impact, and overall impression. The Duquesne University SSHP chapter also won the Outstanding Professional Development Project award in 2016 and 2017 and Assistant Professor of Pharmacy Practice, Kurt Wolfgang, Pharm.D., serves as the advisor to the student organization.